Brian Jean: WildRose's Second Lake Of Fire? Newly minted WildRose party leader Brian Jean is running around the province trying to drum up votes like every other politician in Alberta these days. His latest "fear" seems to be that the PCs are going to start sliming his party. The interview is over but a couple minutes later Jean phones back. He wants to add something. He says the PC run the same kind of playbook as the federal Liberals tried on Stephen Harper. Remember, Jean served in the Harper government, as did Prentice. For the record, Jean says he “has no interest whatsoever” in pushing social agenda issues. Gay-straight alliances will stay with Wildrose. I suspect most Albertans know very little about Mr. Jean, except that his son passed away recently. I certainly hadn't heard of him before myself. As a former MP, I sincerely hope that Mr. Jean doesn't think his resignation erases his past history as a politician, because it does not. 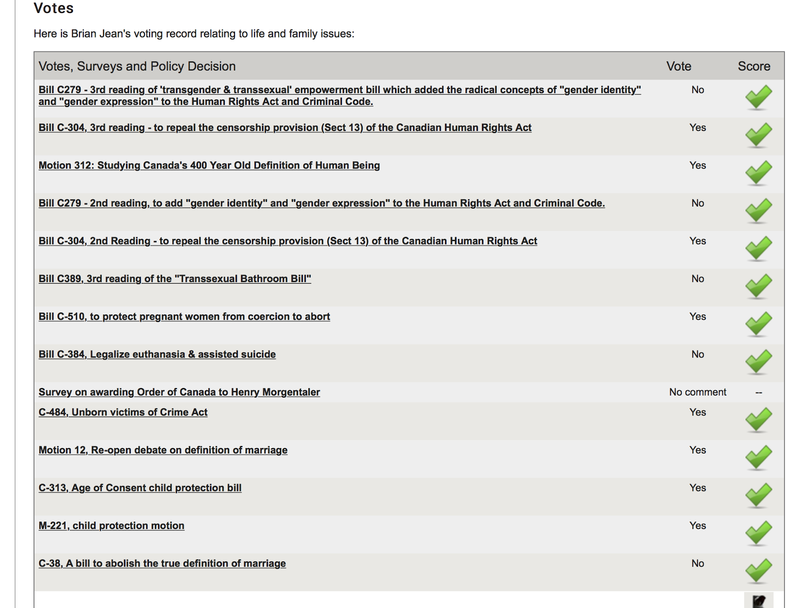 I didn't feel like wading through all of the Hansards since 2004 to figure out how Mr. Jean had voted on every issue, so I wandered over to Campaign Life's lovely little "reference card" to find out how MP Jean had voted on Social Conservative hot button issues since he went to Ottawa. Transgender Rights (Bill C-279 and Bill C-389): Nope. He's opposed to that. Gay Marriage (Bill C-38, Motion 12): Nope, he opposed that. Abortion (Bill C-484, Bill C-510, Motion 312): Mysteriously he supported both bills which would have reopened the abortion debate, as well as Motion 312. Hate Speech (Bill C-304): Yup, he voted to remove hate speech protections from Canada's human rights law. Basically, if you are gay, trans, or female, this guy doesn't have much room for you in his world. If you belong to a minority that is frequently subjected to hate speech, he figures your abuser has more rights than you do too. He's remarkably closed-mouth about his beliefs, which is his right. As voters, we then must turn to his past actions to understand exactly what this man represents. He's been a very dutiful ally to all things the TheoCon base wants. He might be somewhat less verbose about things than the unlamented Alan Hunsperger, but does that mean that voters should trust his statement that he “has no interest whatsoever” in pushing social agenda issues? Mr. Jean refuses to answer for his votes on the matters as an MP, and now he's running to be the next Premier of Alberta. He has a responsibility to be honest with Albertans on this - not just "oh I won't push those issues" (as Danielle Smith so vapidly tried to convince us of in 2012). There is a fundamental inconsistency between his actions as an MP over the best part of a decade and statements made to the Calgary Sun. When newly minted WildRose leader Brian Jean spoke on the party's budget plank, he demonstrated just how unrealistic the neoliberal model of government is. "We believe that any Albertan that goes into any government service will see inefficiencies and things they would actually see to change themselves. We are bringing forward practical solutions to change things. We are not going to affect any front-line workers and I would not suggest it's an axe." Yeah ... sure. When was the last time you dealt directly with a government frontline worker? Registries? Nope - those are all privately operated now. Taxes? Nope - those are all automated these days. Health Care? Yes, if you went to a hospital; no if you went to your family physician or a walk-in clinic. Alberta Works? Yes. Schools? Nope - those people are employees of the school boards. In the two cases where government employees are involved, if you see "inefficiencies" that you want to change, the people involved are front line workers. Jean is also promising to improve health care and education, and make government more accountable. He said Albertans are frustrated by what he called "countless scandals" involving the abuse of tax dollars and the entitlement of senior government officials. The PCs have failed miserably for the last couple of decades to be prudent fiscal managers. The piddling size of the Heritage Savings Trust Fund demonstrates this, as does the enormous deficit the government is facing in the wake of a downturn in the oil market. The leader of the Wildrose Party is promising to return Alberta to balanced budgets by 2017 without raising taxes. But Brian Jean did not offer up full details on how his party would accomplish the feat as he introduced a five-point priority list in Calgary on Wednesday. The centrepiece of the plan is to roll back the tax and fee increases introduced by the Tories in the spring budget and create a long-term savings strategy. So, you're going to reduce taxes (that's what all those fees are that Prentice just slapped Albertans with), and you are going to balance the budget? All without addressing the systemic problem of the current revenue models? Good luck with that. Patient-centred health care and seniors care: implement a 'Wait Time Guarantee' to reduce surgical and specialist queuing. World-class education: "back to basics" curriculum and grading. Democracy and accountability in Alberta: the party vows to curb waste and cronyism by capping severances, reducing managers and eliminating corporate welfare. Supporting rural industries and communities: "We recognize that the long-term health of Alberta depends on ensuring our rural industries and communities have the support they deserve," the party's website says. Seriously? They think they can do massive overhauls of health care and education without spending money? Good luck with that. Prime Minister Harper's current political "divert the public's attention" strategy is to beat on the war drums over ISIS. Yes, ISIS is a brutal lot, and they are doing a lot of horrible things. Should they be held accountable for their actions? Absolutely. Are the western powers the right people to "hold them accountable"? No. Not in the slightest. Way back in 2002 (before I started this blog), Bush the Lesser decided to invade Iraq, turning one foolhardy war in Afghanistan into two wars. Invading Afghanistan was foolish enough, invading Iraq was ludicrously stupid. Both of these were essentially colonial wars of occupation. Over a decade later, the invading forces pulled out after fighting bloody wars against insurgencies in both countries with dubious results. Those of us old enough to remember the 1980 Soviet invasion of Afghanistan, will remember the western powers pouring vast sums of money and munitions into the "Mujahideen" resistance, which ultimately gave rise to the Taliban. Yes, the same Taliban which eventually took control of Afghanistan and gave support to the development of al Qaeda under Osama bin Laden. Starting to see a pattern here? Namely that factions and squabbling among quasi-militarized groups in the area are incessant, and more importantly that foreign interventions have this nasty tendency to end up creating the conditions for the next escalation. So, returning to Bush the Lesser and Iraq, there's an important bit to consider. Bush wandered into Iraq and deposed Saddam Hussein, declaring "Mission Accomplished" a year later. The fighting in Iraq would continue for a decade after that. However, deposing Hussein and banning the Baath party was the beginning of the problem, not the end of a problem. You see, the United States in its usual ham-fisted manner left some half-million Iraqis wandering around loose with no money and lots of weapons. These people became the military leadership of what is now ISIS. That's right. You can pretty much blame the existence of ISIS on the ham-fisted approach taken in Iraq (and to some extent Afghanistan). So, fast forward to today, and Canada's current government is in a mad rush to get into a shooting war against ISIS. Quite frankly, this is a ridiculous thing to do. Even if we (the western powers) were successful in dismantling ISIS, the odds are that whatever intervention we make will create the conditions for yet another violent, paramilitary organization to arise. The simple reality is that wars of occupation are guaranteed not to succeed in today's world. An aerial campaign against ISIS is unlikely to be effective in the long run. It is not terribly difficult for an organization like ISIS to disperse in ways that make aerial attack ineffective, and even if a ground war were to be undertaken, it will create the same problems that we saw in Iraq. WWII style heavy equipment warfare simply is the wrong solution here. This is a war that needs to be fought behind the scenes. Dismantling ISIS cannot be done using standard military approaches. Attempts to do so will simply result in the rise of a new rival - likely originating by whomever becomes the local "resistance" against ISIS. There is a role for western powers in the region, but it is not the military role that Harper has been putting forward. Ultimately, we have to take a "hands off" approach, and allow the region as a whole to settle its own squabbles. The current borders are the consequence of a failed exercise in nation creation as the colonial powers pulled out of the Middle East in the early 20th century. Those borders were created to satisfy the political and economic objectives of the colonial powers, not the peoples who live there. While we can, to some degree, provide humanitarian intervention and relief, beyond that, it is not ours to prop up states which have only limited validity in the eyes and minds of the people who live there. Harper wishes to style himself a "War PM" to deflect attention from Canada's growing economic woes (pay no attention to the 20,000+ jobs lost since November, 2014 in Alberta). Make no mistake, by committing Canada to an expanded role against ISIS, Harper is hoping that Canadians will forget the mess that he has made in this country. He is hoping that Canadians will be so scared by the horrific behaviour of ISIS that we will rally behind his brand out of fear.